It’s aways a pleasure to meet with couples who have clear ideas about their wedding day. Thidar and Ming met with me at the elegant Corinthia Hotel in London last spring and we talked about their concepts. The flower styles Thidar and Ming were drawn too invoked nods to Asia, with hundred of orchids, tropical leaves, grasses and clean lines. The colourful, fun, joyful wedding was sensational! There were so many personal touches throughout the day, for example Thidar made hundreds of origami cranes to decorate the tables and Ming played the violin at the reception. There was also a magical acrobatic silks show to entertain the guests, whose rehearsal we caught earlier in the day as we set up for the wedding. The day was divided into a civil ceremony, a reception, a Chinese tea and a blessing ceremony. 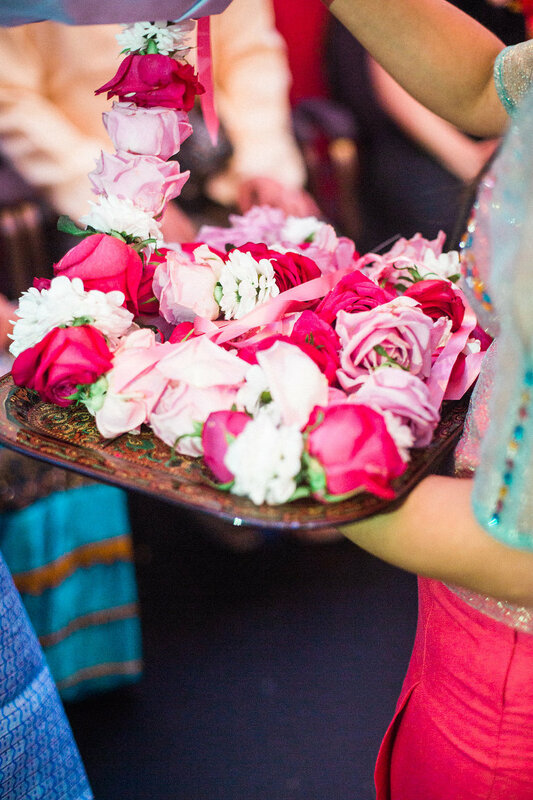 The creative couple picked different shades of pink roses and white and pink orchids which formed the bulk of the flowers. The pops of blue came from the hydrangeas. Looped grasses and folded tropical leaves provided a clean, elegant look and nodded to the Eastern influences. 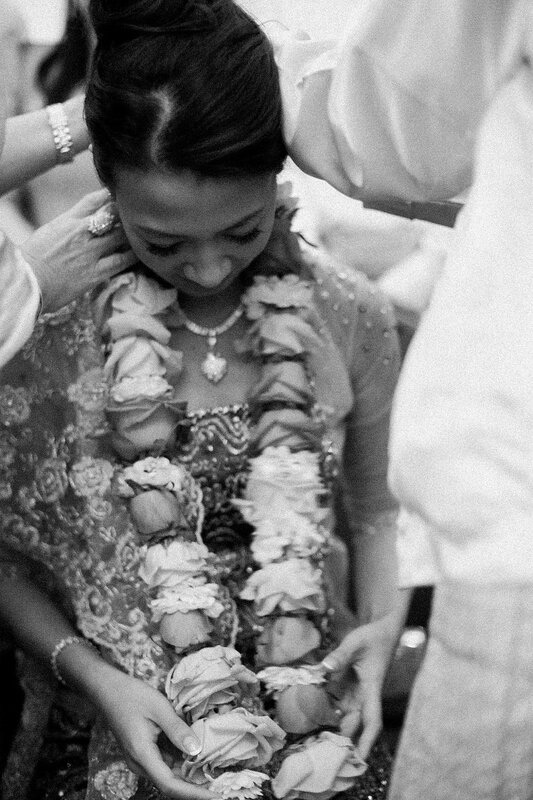 Thidar’s elegant wedding dress worked fabulously with white and pink orchids and ‘All for Love Roses’. The bouquet was slightly asymmetric and it was heart stopping to make with the cascading orchids. The bridesmaids bouquet centred around variegated pink and white hydrangeas, with cluster of roses and looped grass. The sumptuous flower garlands for the blessing were also brilliant to make. There were four different types of floral table design; I loved that for the top table, we used braided foliage to form the base of the arrangement with clusters of roses and bear grass that swept from the centrepiece to the glass stem. The arrangements focused on clean lines and asymmetric shape which can have the effect of drawing together and balancing displays. The three other designs were of different heights to add interest. 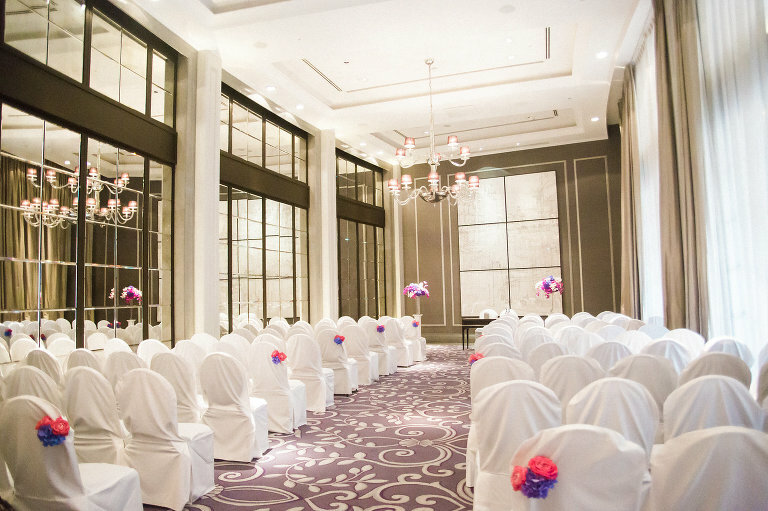 Enjoy the photographs by the talented Xander & Thea, and be sure to read about the wedding on the Corinthia Hotel website. © 2019 Ivy Pip & Rose|ProPhoto7 WordPress Theme|Design + Dev by Northfolk & Co.